One of the most popular children's stories in modern literature is back on screen in a 3-D version directed by Tim Burton and starring his frequent collaborator, Johnny Depp in the latest version of Alice in Wonderland. Alice's Adventures in Wonderland by Lewis Carroll has been a hit with young readers since it was first published in 1865; and from the earliest days of cinema, the tale of the little girl and her trip down the rabbit hole has fascinated and challenged filmmakers. The latest of them is Tim Burton, who has touched on similar themes in films from Beetlejuice to Edward Scissorhands and Charlie and the Chocolate Factory. "It just seemed like the world that Lewis Carroll created [had a] kind of 'trippiness;' but I knew more about it from listening to music and bands and other illustrators and artists that would incorporate that imagery in their work," Burton says. "It made me realize how powerful the material was. If it were written today, it would be mind-blowing today. So the combination of the medium and the material just seemed really right." In this latest version, adapted by Linda Woolverton from elements of the original book and the sequel Through The Looking Glass, an older Alice returns to Wonderland a decade after her first visit. As Alice learns from her occasionally lucid guide the 'Mad Hatter,' things have changed. It is up to the puzzled visitor to slay the Jabberwocky and return Wonderland to its former …wonderful …state. "I think that a lot of people in this time of their lives experience something that Alice is going through, which is this discomfort in your skin and sort of who you are," says Australian actress Mia Wasikowska, 20, who stars as this almost grown-up Alice. "She just has this awkwardness about her that I think a lot of people go through in their life. That was something that I kind of understood and ultimately her story is her coming back to who she was as a young girl, which is very assertive [and] very sure of what she believes is right and wrong. So the story is her kind of reconnecting with herself." Johnny Depp is the 'Mad Hatter' in this Alice in Wonderland, his seventh film with director Burton. "I would have done whatever character Tim wanted, but certainly the fact that it was the 'Mad Hatter' was a bonus because of the great challenge to try to find this guy and not sort of be a rubber ball that you heave into an empty room and watch it bounce all over the place …to find that part of the character, but also a bit more history and gravity to the guy," he says. "So he could go from one second being very high-faluting and a lot of levity straight into some kind of dangerous, potential rage and then tragedy. Trying to map that out was very interesting." The cast features Helena Bonham Carter as the Red Queen with Anne Hathaway as her sister and rival the White Queen. English TV star Matt Lucas plays both Tweedle Dee and Tweedle Dum. Stephen Fry gives voice to the quizzical Cheshire Cat; and Michael Sheen is the White Rabbit in the story that he believes continues to resonate. "Probably as most people do, I knew the characters of Alice in Wonderland before I ever read the book. I think they are just ingrained into western consciousness," he says. "For me the allure of the story is that we all live in this illusion that we are civilized and that everything makes sense and everything has a place. "Alice in Wonderland" shows you that actually it is very thin film between sanity and insanity and total wildness and chaos and fear and all that kind of stuff. Somehow that seems to be the most true expression of what it is like to be a child …where things are most familiar and strange at the same time. When you think you know what something is, suddenly, it shifts and it becomes something else and we kind of grow up and forget the truth of that or buy into the illusion that it's not the case. I think one of the reasons we are drawn back to Alice in Wonderland is that somehow reminds us of what the actual truth of our life is." Alice in Wonderland is produced by the Walt Disney studio, which made the 1951 animated version familiar around the world. 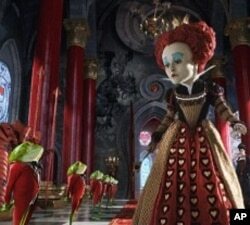 The musical score for this Alice is by Danny Elfman, another frequent collaborator with director Tim Burton.